Two Crock Pot recipe's in a row? Ok, maybe not the worst. Just not the most creative. 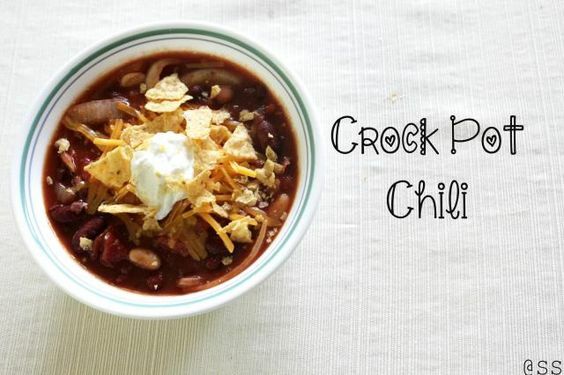 I started making Crock Pot Chili weeks after we got married last November. It was a quick recipe to make, the husband loved it, and it was perfect for the cool, crisp Florida nights at home. This is a very healthy version of chili and is vegetarian as well. "But my man is a MAN and want's his meat in his chili! How do I get him to eat Vegetarian?" My husband spent 4 years in the Army and is as much as a man as you are going to get so I know how it goes with men and their meat. But Trust Me, you can get your husband to eat vegetarian meals if you make them taste good! Hickory Flavored Liquid Smoke is my "secret ingredient" when it comes to chili. It makes it taste SO good. Just throw all the ingredients into you favorite crock pot (4-6 hours on high or 6-8 on low) including the chopped up onion if you want to add that. Feel free to use other beans. I sometimes use black or pinto beans. Always include kidney beans though. Kidney Beans are the essential chili bean. Add chili powder and liquid smoke (to taste) to the chili and mix up well. When it tastes (or smells) good, place it in the crock pot for 6hrs on low. *NOTE* Feel free to make this on the stove as well. I used to do that all the time. Just make sure to saute the onions before adding everything to the pan and simmer the chili till you think its done. And TADA. Crock Pot Bean Chili. Top with your favorite chili essentials. Mine is cheese, sour cream and a little bit of corn chips. Don't forget to PIN this recipe if you like it so much!